Creamy, delicious, wonderful risotto. I love how creamy rice gets when cooked slowly and gently. 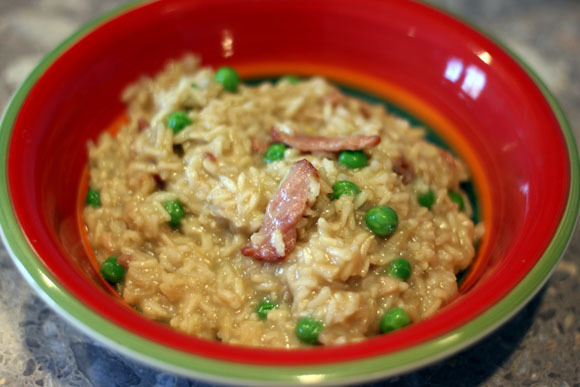 Adding bacon really takes risotto to a whole new level of flavor. I typically use short gain brown rice for my risottos even though it’s traditionally prepared with Arborio rice. Both seem to work well for making risotto. Arborio rice is an Italian short grain white rice that is high in starch, making it great for risotto. I just prefer the taste of brown rice in general as it is more flavorful. 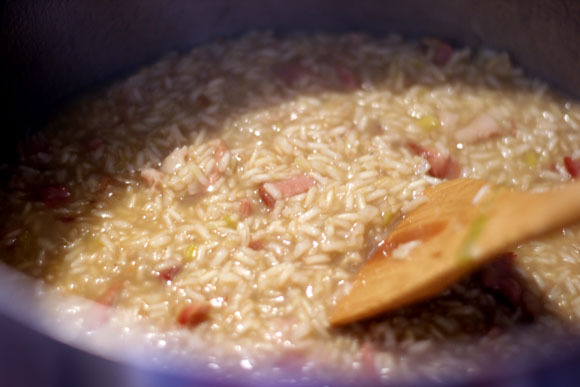 Arborio rice only takes about 15-20 minutes to cook and uses a lot less broth. This leek, bacon and pea risotto was actually made with long grain brown rice instead of short grain. It still got plenty creamy as it cooked. Use the rice you like best and enjoy this leek, bacon and pea risotto. Bring the broth to a bubble over medium heat. Once hot, turn to low to keep warm. Heat a large pot over medium-high heat. Add the bacon to the pot and cook until browned, about 5 minutes. While the bacon is cooking, cut the leeks in half lengthwise, then thinly slice. Rinse and pat dry with a towel. Add the leeks and cook until they are softened, about 2 minutes. Stir in the rice and let it brown up for 1 minute. Start adding the warm broth, a ladle at a time. Stir the rice each time broth is added and let cook until almost all the broth is absorbed before adding more. Keep adding broth until the rice is softened and creamy, about 45 minutes. Stir in the peas when the rice is fully cooked. Remove from heat and stir in the Parmesan, lemon juice, salt and pepper.